Paroi Munchen will against an Italian club, Maetsrelli tonight. So, this my line up for my firs match in the league of group 431. By judging from this strength, I'm just satisfied with my stricker and defender strength, but my midfielders are not strong enough. 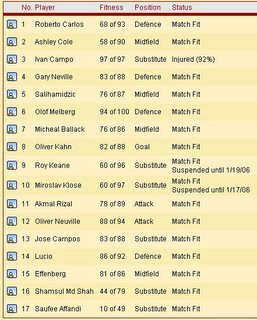 Klose and Keane are suspended until 19 and 17 of January 2006. This league will be more challenging, since most of the promoted team are very strong in their previous league. I've recruited 2 youngsters for my future player which are Shamsul (18) and Sauffee (17). They will be trained just for physical training to improve their stamina. Later, Shamsul will contrate on midfielder training and sauffee will concentrate on stricker training.